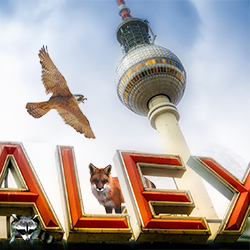 Berlin has 1,500 urban foxes, 1,300 nightingale territories – more than the whole of Bavaria – and 600 natural monuments, mostly in the form of beautiful, old trees that managed to survive both World Wars despite their inner-city location and have many exciting tales to tell. Berlin is known as the capital of bats; it also has the highest density of goshawk territories in Europe, and entire beaver families have been spotted within walking distance of the city’s government district. Who would’ve thought it? Come and see for yourself on one our Stadtnatur Berlin tours. Our tours can be booked individually. We`re looking forward to your request. 1,500 urban foxes, 40 beaver families and thousands of wild rabbits hint at the abundance of fauna in the so-called ‘capital of wild animals.’ Some well-known examples include the fox from the Chancellery, raccoons at Alexanderplatz, and wild boar that have been spotted frequenting popular tourist hotspots. It’s usual for raccoons, peregrine falcons and bats to be secretly living among us in the heart of the city. Their trails provide clues as to their preferences and habits. This tour starts at the Chancellery and leads us to one of the most popular places for wild animals in the city.